It goes without saying that as with all golfers you would like to hit the golf ball farther. Whether you are struggling to keep up with your golfing buddies, want to carry trouble on a particular hole, reach the corner of a dogleg or simply play your approach shots with more loft, the common denominator is you need to hit the ball farther. You want to trade in being the shortest off the tee for a game plan that allows you to be pull out a long drive at will. Youâ€™re disheartened thinking isnâ€™t it about time you said goodbye to the frustration caused by short drives and took advantage of the knowledge that is out there to hit the ball longer and straighter! 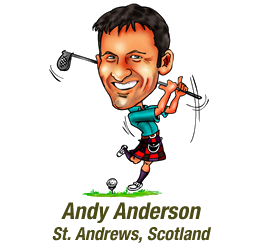 Wouldnâ€™t it be great to be regarded as the sneaky long golfer in your fourball. Thankfully the tips within this article will make this a reality. Initially though, while you appreciate the fact you would like to hit the golf ball farther, you are also acutely aware that this needs to be in tandem with good directional control. Obviously hitting the ball deep into the rough due to your newfound length certainly wonâ€™t benefit your game. In fact it would be wise to offer this word of caution now before getting carried away with your dreams of monster drives. Quite simply hitting the ball farther doesnâ€™t automatically translate into lower scores. It would be fair to say that in theory the game becomes easier because you are hitting shorter clubs into the greens and the shorter the club the more likely you are to be closer to the hole. However, unless you practise these shorter shots you may have not played much in the past, you wonâ€™t fully capitalise on the huge advantage you have been given in hitting the ball a further 20, 30 or even 40 yards. How often have you been outwitted on the golf course by the canny short hitter that puts a far greater emphasis on accuracy than length? All in all itâ€™s fair to say we are all looking for longer and straighter drives. To be frank, finding that extra distance off the tee without sacrificing accuracy can sometimes seem like the hunt for the Holy Grail. The search for a few more yards continues particularly for those golfers fed up being the first to hit their second shot. This disappointment will always fuel the desire to hit the ball farther. To put it bluntly it can be a real bind for those who are fed up of laying up on a par 5 and not even having the option of reaching in 2 shots. Equally not being able to reach all the par 4s in 2 shots on your home course can also be a downer. Fortunately learning to hit the ball farther will no longer be a mystery. The following swing tips will help unleash longer drives, leaving your mates astounded! These 11 tips will help give you more length off the tee. Much can be learnt from studying the long hitters in the game today and by carefully studying the key factors that contribute to them hitting the ball further itâ€™s possible to present these tips to you. You can create additional power by fanning your left front foot out at a 45 degree angle. By simply doing this you make it easier to quickly clear your hips and lower body as you swing through. The only word of caution is to not fan the foot too much as this can restrict your back swing turn. Wildly swinging with your arms will not help you hit the ball farther. In actual fact using your hands and arms in such a manner actually slows down the club head. The key is not to frantically hit the ball as hard as you can, but instead slow your swing down. If you start to feel tense, your muscles will contract and this is counter productive as they move slower than relaxed muscles. Make sure your backswing is controlled and deliberate. When you swing slower itâ€™s easier to keep your balance and build more lag into swing that ultimately creates greater club head speed. Make golfers restrict how far they can hit the ball by making a limited hip and shoulder turn. The aim should be to turn these big muscles fully so as you wind up your body as much as possible. Thus creating a longer swing with greater club head speed for longer drives. The wider the swing arc the faster the club head speed. For one minute compare your golf swing to a vinyl record, where your spine is the equivalent of the spindle. As the record spins the outside edge spins faster than the inside at the spindle, the speed increases as you move from the centre to the outside. Likewise with the golf swing, the farther the club head from your spine the wider the arc and faster it travels. Thus the reason why a longer shaft can create increased club head speed. If youâ€™re not hitting the ball as far as you would like itâ€™s important to check to see whether your wrists are fully cocked at the top of the swing. This action is called loading the club, where you set it up so as it can be released later on in the swing. With no cocking the club can only swing down as fast as you can swing your arms. Having successfully loaded the club so as itâ€™s ready to be released later on in the golf swing, you need to to release the club at impact, this is called uncocking. This needs to happen as late in youur swing as possible. By delaying the uncocking you have the opportunity to accelerate the arms increasing the overall club head speed. The ball will travel farther when you keep the club head cocked as long as possible as you lag the golf club on your down swing. Do not release you lag until you reach the impact zone. To hit it farther you need to ensure your maximum club head speed occurs at impact. Too many golfers feel that in order to launch longer drives they must increase the speed of their arms. This isnâ€™t correct as it is the actual club head speed and not your arms that produce longer drives. For every 1mph you gain in club head speed you gain 2.5 yards in distance. Work on hitting the ball off the sweet spot in the centre of the club head. This way when the ball compresses and expands off the face it will do so without any loss of distance. Plastic stickers can be applied to the club face to determine exactly where the ball is contacting it. Distance is lost when the ball curves left or right due to it not being hit with the centre of the club. Additionally you tee the ball up with tees that are coloured in sections so as you can determine a consistent height for each shot. This way you can discover the optimum height for your own golf swing after trial and error with different heights. You donâ€™t need to be told that improving your fitness will help you hit the ball farther. Going to the gym and performing specific golf related exercises for stronger legs, back and abdominal muscles is something we all see the tour professionals do. For your own fitness itâ€™s recommended you concentrate on strengthening your core so as you can make a full back swing, from where you can explode into the ball with maximum club head speed. A quick solution is to swing with a weighted golf club to improve your flexibility and strength. You may be losing distance because you slice the ball. This can be a real drain on yardage and learning to draw the ball with an inside to outside swing is definitely a way to add extra yards. Even if you are hitting a fade, a draw will typically be a lower shot that runs out more. Finally take a minute to reflect on the fact that club performance hasnâ€™t improved all that much over the years. To illustrate this fact take a look at this video on the 18th hole of The Old Course, St Andrews. Here the Discovery Channel film Hamish Steedman from the St Andrews Golf Company compare the drives of a modern 460cc driver, a 1920s brassie and a long nose club from 1880s. The conclusion is that over the years the golf ball has dictated the increase in distance more than the club. Even though moderns clubs have oversized sweet spots their improvement in performance is a lot less siginificant than the aerodynamic advancements in ball technology. The average golfer should look to play with some of the specific distance balls on the market today. They have enhanced the game for the recreational player due to a design that maximises distance and minimises spin. You may possibly be playing with a ball that offers more spin than you currently need. A high spinning ball only exaggerates your side spin, so you inadvertently turn your draw into a hook and your fade into a slice.